When did you start reading Nimona? How you did you find out about it? 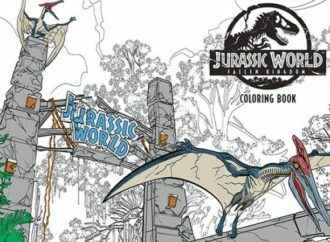 What were your initial thoughts? I think when Chapter 3 started, approximately. I think I started following Noelle Stevenson on Tumblr around the time the first Avengers movie came out. I knew about Nimona, but didn’t start reading it till about a year later. Once it finished. I read it backwards. I used to be much more Tumblr-attuned and followed gingerhaze, as many do, and so, I knew! I thought it was a tremendously good idea — someone with the compassion and active social responsibility of Stevenson, somebody with the artistic skill and track record of effort and reliability. This is exactly who should be producing fiction for younger audiences. Noelle Stevenson is SO COMICS and she is SO COMMUNITY, and I just respect her and her work so much. Probably about a third of the way in. I was getting into webcomics and talking to the staff in my local comic shop (Travelling Man in Manchester and Abby Ryder — please come and visit us one day, Noelle! ), and they just raved and raved about Nimona so I knew I had to try it. I was sucked in pretty much straight away, and while the art would have been enough to sell me, it was the heart that I fell in love with. It was immediately apparent that this was a story I would walk away from knowing the characters and caring about them. Good art catches my eye, but writing like Noelle’s makes me a fan. Did you read it weekly? At first no, because I like to let my webcomics accumulate some pages. 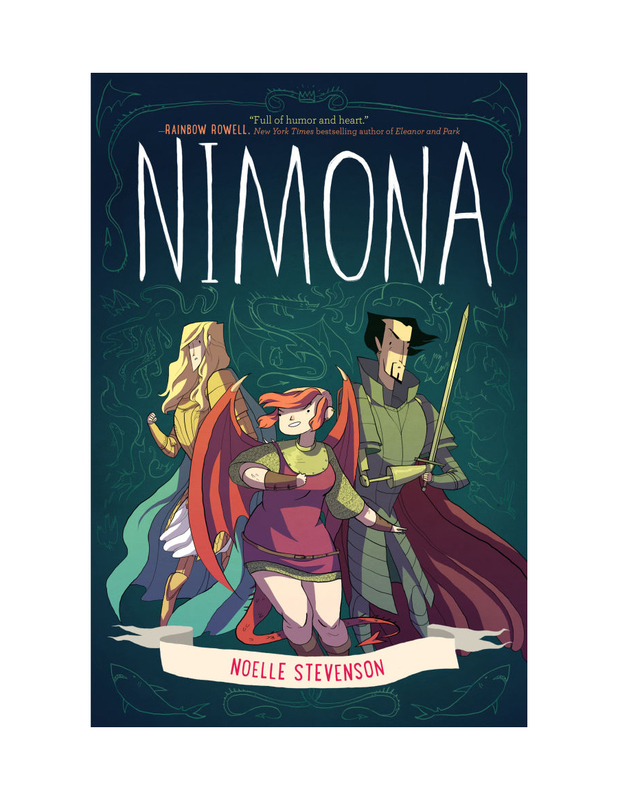 But then things started to get really intense — I guess like at Chapter 5, when we start to get glimpses of Nimona’s past, the action starts, and there’s the Nimona-Ballister relationship — I couldn’t wait, and I was there every week. When I first started, I read it in one day — but then I didn’t read it again for several months. I started over, added it to my feed, and from that point was pretty much reading every week. Nope! I like a chunky reading experience. Since I knew from the start (or pretty early on?) that it was going to be a story with an ending, and that it would be published in print (and so was unlikely to be longer than one volume), I figured I could wait. So I did! I tried to, but I couldn’t enjoy it that way. I always wanted more and I struggled to follow it. Eventually, I started reading in batches. I would wait a month or so and then catch up, and then wait and catch up. I didn’t realise Noelle had an ending planned for the story until she announced it on the website around 3/4 in. At that point, I stopped reading and waited for her to finish so I could read through to the end. Did you participate in the community somehow? The comments, maybe? Only lurking. I regret it now, it seemed fun. Unfortunately not. Every once in a while I would reach out to Noelle or other readers on Tumblr or Twitter, but not often. Nah. For me, at this time, it’s not a story I needed to discuss much. Comment-section communities have never worked too well for me, to be honest, it feels a very unwieldy sort of communication… it’s hard to believe it’s a conversation. No, but I wished I had. By the time I joined the community, it was fairly well formed, and I thought it would be hard to register with people. But it’s been hard, in all honesty, not to have anyone to share Nimona with. I cried when I read the ending, and I very much wanted to explain to someone what it was that had mattered so much to me about this comic I was reading on my phone or my iPad during quiet moments of the weekend. What is your (mental) alternate universe fanfiction? Noelle’s happy family AU art killed me. Like fathers Ballister and Goldenloin with baby daughter Nimona. Aaaaah, it was so mean, Noelle. Also sometimes I picture just Ballister and Nimona being “villains” (but the good kind, no killing) forever, and everyday they go to an adventure or something. 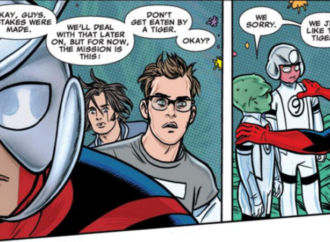 Science plus shapeshifting sounds like a good team. Oh my god, the happy family AU is simultaneously the best and the worst AU. When she first started posting art for it I thought “Aw, how cute! I love it!” but when things started getting really intense in the comic, and we weren’t sure which members of our happy family were gonna make it that turned to “NOOOO, NOELLE, WHY ARE YOU DOING THIS TO US.” I still love it though, especially now that it’s over, and I hope the happy family AU might become canon in the epilogue. I’m completely satisfied with “real version” events. Pain is OK.
God, I don’t know if I have one, but what a great question. I love the story as it is and wouldn’t wish it to be any different, but I guess I’d read more. I’d like to see where Nimona went next. But I wouldn’t need anyone else’s story to continue. I just feel there’s so much more to do with her I guess. How much do you ship Blackenloin? Totes. Although that is a painful ship name. How did you respond to the changing process (“evolution”) of the art and plot? It was awesome, but at the same time I really liked it in the beginning anyway. I guess I would’ve liked it too if the style continued the same. Also, probably my heart would ache less. 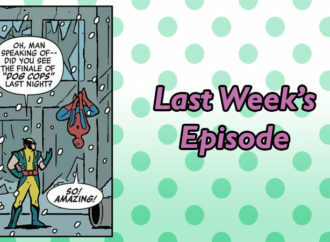 I loved it from the beginning, but I think the changes Noelle made ultimately made it a better comic. Had she continued with the goofy fun-all-the-time thing, it would be great, and we would love it, but I don’t think we would have been affected by it as much. 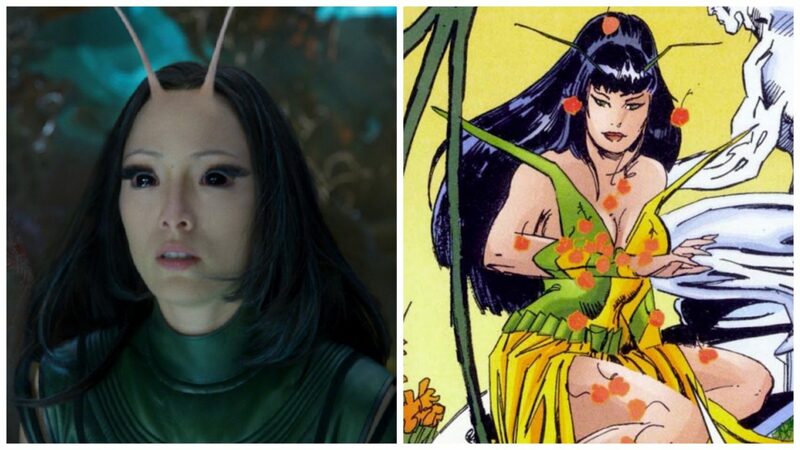 Everything about the comic matured over time, and that’s the whole reason we’re having this discussion right now. As for the art, I’ve noticed that a lot of webcomics tend to start out kinda basic, and as the creator has more time to devote to them, things become cleaner and brighter with more intense colors. That’s absolutely the case here, and again, I’m glad it happened the way it did. Claire, I’m posting a comparison of the first page and the last one because you HAVE to see it. I think you will be shocked. Oh wow, yeah, it really did evolve! Nice. Warmer colours (warmer EMOTIONS?). I didn’t notice. That’s what happens with comics, artists evolve, characters grow, and the art grows with them. I loved the art the first day I saw it, and I love it today, but I don’t have a preference. As for the tone and style, I feel like that was part of the story that was told. Bone is a good comparison. The first couple of ‘books’ of that story gently introduced characters and the situation of those characters and with a lot of comedy that helped us love the Bone brothers. Nimona is the same for me, but the threat had to emerge slowly, because in truth it was there all along. It’s just peeling back the layers of your character to reveal them as a complete person. I think that ability is one of the things that shows Noelle is a true talent in the industry and she will just get better. Admittedly, the image that Carolina posted blew my mind a little… but I’m sort of pleased I didn’t notice that. Was the ending satisfying to you? Yes!! Sad and bittersweet, but satisfying. Absolutely. I liked that it wasn’t an overblown kind of thing, but subtle and revealing. Noelle tells us a lot in those final panels, even though they are very simple and not much is said. It was sad, sure, but in the end everyone lived, which leaves us with a lot of possibilities for the future. Yes. Fully. But so was the TJ & Amal ending! I read TJ & Amal in chunks, though, over multiple years, instead of all at once (and TJ&A forwards, as opposed to Nimona, backwards) so my reading experience — my reading atmosphere — was different; more of a sense of lasting ennui. Nimona ended fairly abruptly, but it was more action oriented. TJ & Amal ended softly, but it was a roadtrip. So satisfying. I thought it could end on a downbeat note, so that it didn’t felt like a really gift. I wouldn’t have hated it if it had, Noelle’s story was HER story and by that point I believed in her enough to believe that whatever she decided was ‘right for the characters.’ But yes, I needed that feeling she gave us right at the very end. What about the print book? Will you buy it? 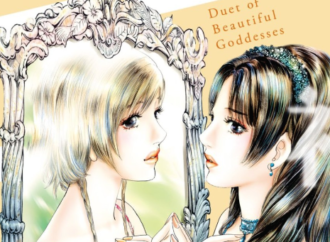 There will be bonus epilogues… Do you think it is obligatory reading or actually complementary? What do you think will happen in these epilogues? Possibly. I’m looking at those epilogues as complementary reading, because I really want the “real” ending to be there in the website. I think Nimona will come to visit Ballister sometimes… I mean, at least in the holidays, right? She has to, come on. I am definitely planning on buying it. While I do think they’re complimentary because Noelle had essentially tied everything together on the site, I’m really looking forward to the bonus epilogues and other extra material. Like I said, I’m holding out for a big happy family resolution, or maybe a return to the humor of the early pages, but whatever happens in the epilogues, I trust Noelle to make it awesome. I would definitely buy it to give to people who are a) young or b) don’t credit comics with being much good. I don’t think I need to own it for myself (I might change my mind if I suddenly became affluent). I didn’t know about the epilogues until you just said that… I don’t know how I feel… Yes, I do, I want more, I always will, more is good. The print book is a must for me. I could never spend as much time reading something someone had so generously given us for free and not invest in it given the chance. But more than that, I want to own a copy of Nimona, so I can go back there whenever I feel the urge. I also think a readthrough in print will reveal a whole different level to the story, and I’m hugely looking forward to that. I also want multiple copies to give to my two nieces and two goddaughters. First one to dress as Nimona on Halloween wins! 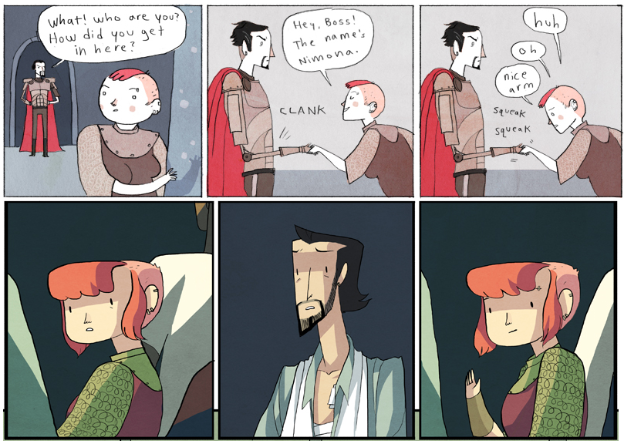 What does the future hold for Nimona (the character)? I think she has too much in her past to have a “happily ever after” life. She will probably be a bit bitter and sarcastic person. Like Ballister in the beginning. Wait, wait. Now that I think about it, Ballister will be to Nimona just like Goldenloin was to Ballister… he betrayed her, and that’s bad, but in the end love prevails (ugh did I say that? ), and she forgives him and all misunderstandings are explained. I don’t think things can be exactly what they were before, but it would be nice if Nimona and Ballister could work things out and continue with their shenanigans (slightly less evil and malicious now that there’s no Academy there to be messed with). I can’t imagine. She’s so other that I don’t think I can create a future for her that’s relevant to me, you know? I don’t know. Trouble I would imagine. I would like to see her go on, but I don’t like to ‘fanfic’ what that might be. Noelle knows, not me. One day maybe she will decide to tell us, but I’ll wait until that day. I’ll keep looking at Noelle Stevenson’s work. Although I don’t think she will do a webcomic again so soon, if ever. So there is a hole in my heart. 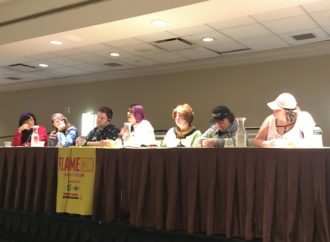 Actually she has said that she does have another webcomic in mind, though I don’t think we’ll be seeing any of it till next year at the earliest. For a while she was posting a lot of art of roller derby girls, and if this is where she is going with her next comic I might actually die. And we still have Lumberjanes! 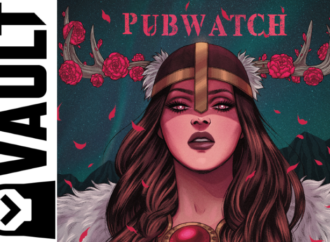 So it’s not like she’s vanishing from comics forever now, and I’ll definitely be keeping up with her other work. I will feel a renewed excitement about the future of American comics. Stevenson’s already good for the climate. I’ve no doubt it’s on and up for her. I’m intrigued to see what Noelle does next and I think she’s now on my list of people who I will follow for good. I like Lumberjanes a lot, but it’s not filling the Nimona shaped hole in my heart, and I doubt anything will until I see Noelle in complete control again. That doesn’t worry me, like Claire says, Nimona gave me a lot of faith in the future of comics and for a number of reasons. It was my first foray into webcomics, and honestly that was a medium I didn’t have a lot of love for or believe in before then. Also, the fact that someone chose to give us their work for free like that, I believe in that, and it’s nice to see real talents do, too. The internet offers new opportunities for artists and writers to take a chance and build a fanbase on their talent. Nimona opened my eyes and asked me to look a little bit further afield. 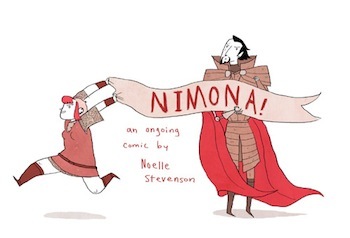 I’ve found so much since then, but honestly, in my heart, I seriously doubt I’ll ever find another Nimona.